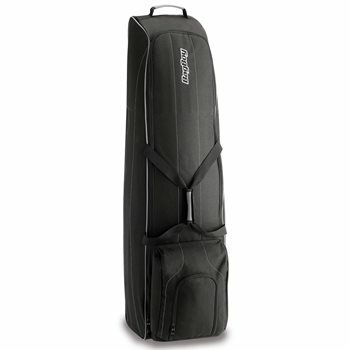 The Bag Boy T-460 Travel Cover is great for when you want to safely carry your clubs with you on your travels. It features smooth rolling wheels and reinforced corners for durability, lockable wrap-around zipper for easy access to club compartment, and reinforced nylon carrying strap with velcro locking handle. Additionally, this travel bag has internal compression strap to stabilize the bag during travel, oversized dual zippered shoe/garment pocket, and ID tag for easy identification. The bag fits a 48” driver and up to a 10” cart bag.